Available as a single DVD, Double DVD-set and Blu-ray disc. I thought I might have a suspension-of-disbelief problem with 21 as I read Edward Thorp’s Beat the Dealer when it came out in the late 60’s, spawning a veritable cottage industry, coupled with my firm belief that you can not beat a negitive expectation game over the long haul. I realize counting is supposed to make it a positive expectation. Sorry, I’m not convinced. But…21 is a darn good yarn. Well written and acted with charecters you can care about. What’s not to like? MIT whizkids recruited by their Professor (Kevin Spacey) drill like crazy in card counting and take on Vegas, jobbing the Casinos for millions. The stuff that dreams are made of. It’s a character study of the effects of to much, to soon and is well handled, following Ben Campbell (Jim Sturgess) as he transforms from a likable geek to…well something less, dumping his two equally geeky friends after a years worth of work on a robot car to be entered in a contest to his falling out with the Professor after a quarter of a million dollar screw up and his beating by Casino security to show him the error of his ways. 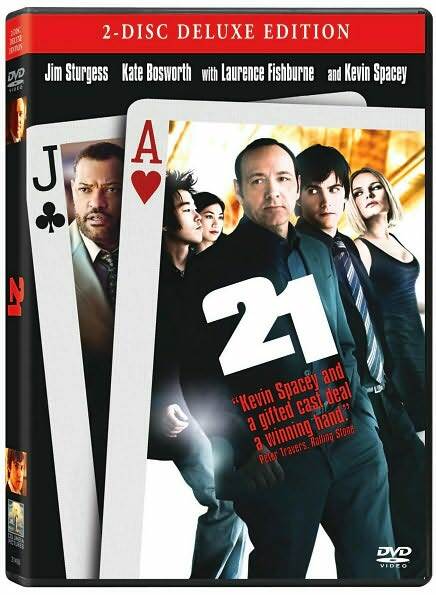 There is a second disc of extras including a copy of the film for your computer (assuming your computer is newer than mine) including the cast explaining the game and card counting..
21 is a good film and a good time.